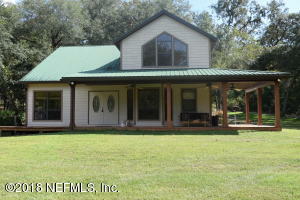 FANSTASTIC HOME ON BIG LAKE SANTA FE! Custom build and designed to take advantage of the amazing views of this beautiful lakefront property. Light and airy with high ceilings, beautiful wide plank wood floors, trim details on all the windows and a beautiful wall of french doors invite you onto the spacious veranda with summer kitchen. 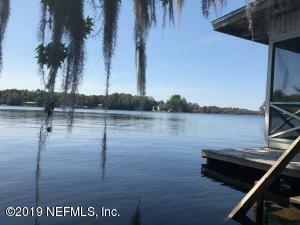 Wander down to the sandy beach front with fire pit, dock and boathouse and prepare to enjoy the lifestyle this lake offers with a variety of water sports. The entire property has beautiful mature landscaping with fruit trees and flowering shrubs make this gated home the perfect choice. Here is you chance to watch the spectacular sunrise over the lake. This home has true Southern style charm. 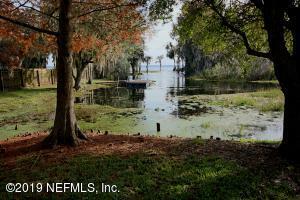 On the ''BAY OF SANTA FE LAKE'' in Historic Melrose Florida is the Rosemary Daurer home. The late Mrs Daurer was one of the instrumental figures who helped preserve what we call the ''Magic of Melrose''.The main block 4/3 home, the 2/1 Bay Front cottage and boat house with private lagoon sit on 1.30 acres. The property is landscaped with many varieties of citrus trees, native flowers, and large live oaks draped with Garlands of Spanish moss. The 2 story main home features: 2 master beds w/ adjoining full bath, large living room w/ wood floors and ceiling, fireplace, spacious kitchen and a solarium that overlooks Melrose Bay. The 2/1 cottage right on the waters edge has a large screened porch for those unbelievable sunset views. Come join us and experience ''THE LAKE LIFE'' . 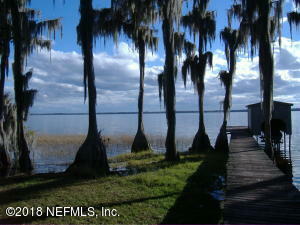 Fantastic Primary residence or Vacation Rental on Lakefront on Lake Melrose with incredible income producing options. 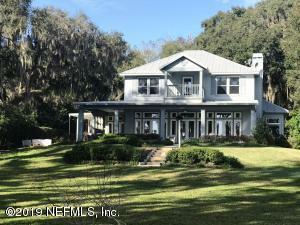 This Lake front home features a very spacious main home with 3 bedrooms and 3 full baths. Entertaining is a snap with open kitchen floor plan with full open glass doors to the pool deck. The inside becomes the outside. Guests and friends can move around the very large lot , perfect for 4 wheeler or golf-carts. Plenty of space for pool tables and gaming. Enjoy the afternoon on the water, grilling or playing a game in the front. Property is fully gated and fenced. When the evening comes the fun doesn't' need to end. Full Private guest suite with bathroom off the garage AND a second private bedroom off the pool deck to accommodate overnight guests. Here are two opportunities for you to be part of ''THE LAKE LIFE'' in a place known as ''THE LAKE REGION'' near Historic Melrose Florida. 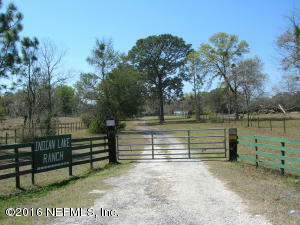 This sale consists of two 100 ft Lakefront parcels in the area on Big Santa Fe fondly called ''The Pumpkin Patch''. 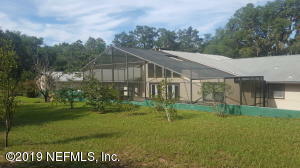 The home lot has a concrete block 2 bedroom 1 bath home with dock, beautiful live oaks, and several producing fruit trees. The adjacent vacant lakefront property is a wooded 100 ft lot. Buying both would be wise; however, they could be available individually? It seems the world is discovering Historic Melrose and it's Addicting Charm, Music, Art, Various Restaurants, Unique Shops, Professional Services, Cultural Educational opportunities, and more. Easy commute to Gainesville, Palatka, Ocala, & Jacksonville. 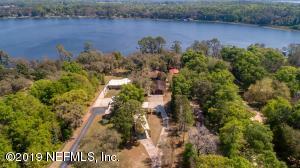 Just minutes away from Melrose Florida is the original 6/6 home built in Ashley Lake Plantation by Mr Harold Ashley, known as ''Ashley Lake Lodge'' The rock built 6/6 home stands tall on 2.5 acres over looking beautiful sunsets on Ashley Lake. 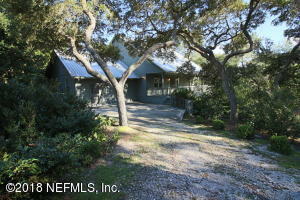 Home features include: Large living room with adjoining great room each has custom Floor to ceiling stone fireplace's. All 6 bedrooms have full size baths and walk-in closets. The kitchen is over sized with wrap around granite counter tops with Gothic style wooden cabinets throughout the whole kitchen. The east side of home has its own entrance with living room, bedroom and full bath. 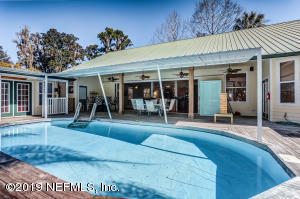 The home has full size pool w/ Jacuzzi,as well as a stadium seating rock/steam sauna. The back of yard features: 300 ft of lakefront, kids playhouse, Etc.